I met Mari in front of Madison Square Garden on a sunny day in October. 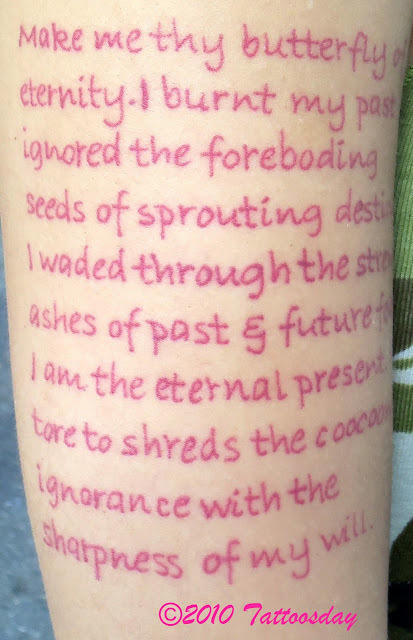 How could I not stop and ask her about this tattoo? Mari explained that this is an Ananda prayer, that her friends were meditating on it for a week. Make me thy butterfly of eternity. I burnt my past. I ignored the foreboding seeds of sprouting destiny. I waded through the strewn ashes of past & future fears. I am thy...butterfly of eternity, sweeping through immeasurable time. The beauty of my nature-wings I spread everywhere, to entertain everything. Suns & stardust are spread on my wings. Behold my beauty! Cut all the silken threads of thy shrouding folly: follow me in my flight to myself. The butterfly symbolizes transformation, a phase everyone goes through at one point or another in time. Mari explained she loves math and generalized that, with this equation, "you can generate anything in the universe". In theory, at least. Here, it gets a little hazy for me. Part of this tattoo contains "f(z) = z^2 + c" which is described as a complex function. Then there is the part that equates the square root of -1 to the value i. This is a formula for an imaginary number. I'm bowing out here, knowing there's no way I'll be able to explain this part of the tattoo adequately. Readers are welcome to try in the comments section, below. Mari's work was inked by Kevin at The Tattoo Shop in Lansing, Michigan.